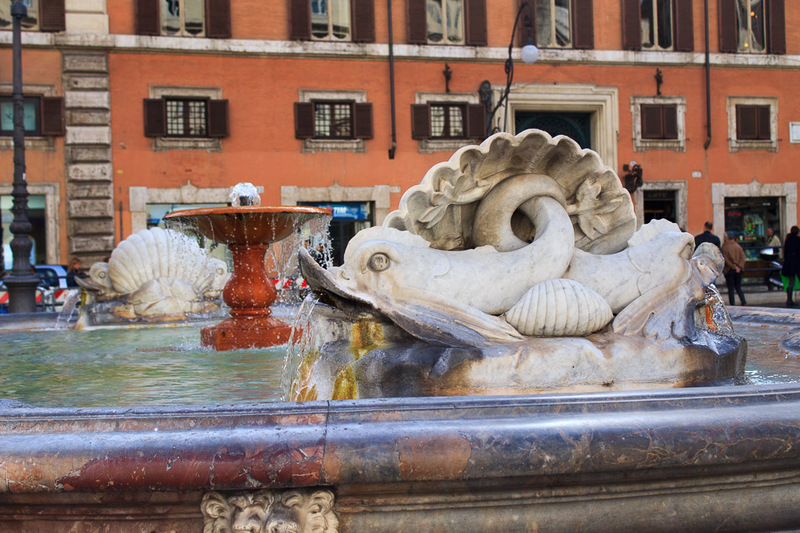 The Foutain in Piazza Colonna is one of the oldest fountains in Rome. It's located in the same piazza as the Column of Marcus Aurelius, on the west side of Via del Corso between the Pantheon and the Trevi Fountain. It was designed by the architect Giacomo Della Porta and constructed by the sculptor Rocco Rossi from Fiesole between 1575 and 1577. Giacomo della Porta designed most (16?) of the fountains which Pope Gregory XIII and his successor Pope Sixtus V built to distribute the water from Acqua Vergine and Acqua Felice. It was built to provide clean drinking water to the Roman residents. Della Porta's original plan was to place an antique Roman statue of Marforio (now in the Marforio courtyard of the Capitoline Museum), a sea god, in the fountain, against a background of a rocky grotto, behind which the Column of Marcus Aurelius would be seen. Instead, the fountain constructed was simply an octagonal basin of pink marble from the island of Chios in Greece, with 16 carved white marble lion heads around the basin. A round stone bowl was placed on a pedestal in the center and water flowed from this bowl into the basin. In 1830, the original damaged central bowl was replaced with the current one made of white marble by the architect Alessandro Stocchi. He also added two groups of dolphins, their tails wrapped around seashells, sprouting water from their mouths, at either end of the basin. 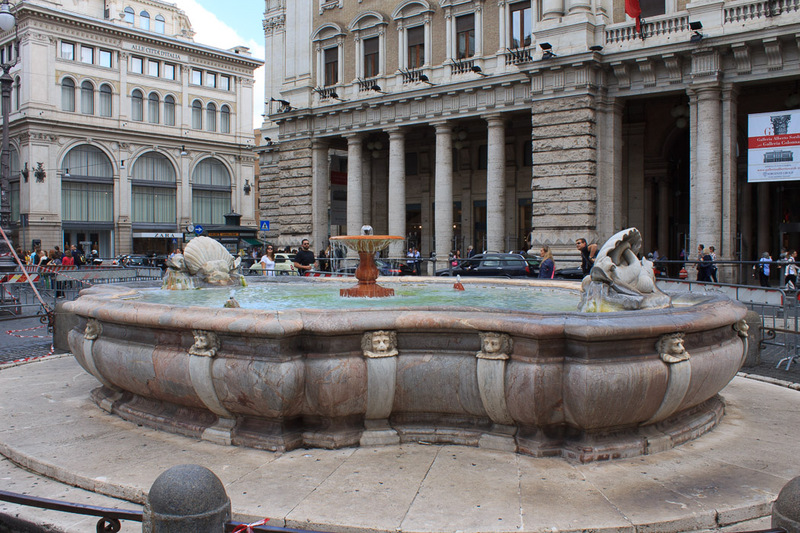 See all Foutain in Piazza Colonna photos.